It is an undisputable fact that outside of the NWSL, there are very few women in positions of administration in American soccer. While amateur leagues like UWS and WPSL boast women ownership and administration, the crossover of women into men’s soccer is significantly limited. Professional leagues like USL and the former NASL have had very few if any women in administration and ownership, and on the amateur side leagues like the PDL, UPSL, and NPSL have traditionally been male-dominated. The exception, of course, has been Cindy Spera – who was recently promoted from Director of Operations to Managing Director of the NPSL, replacing the departed Jef Tiffault. Her background has varied in the financial world, but at the same time, overlapped from her soccer playing career to administration and ops, to now management and leadership. 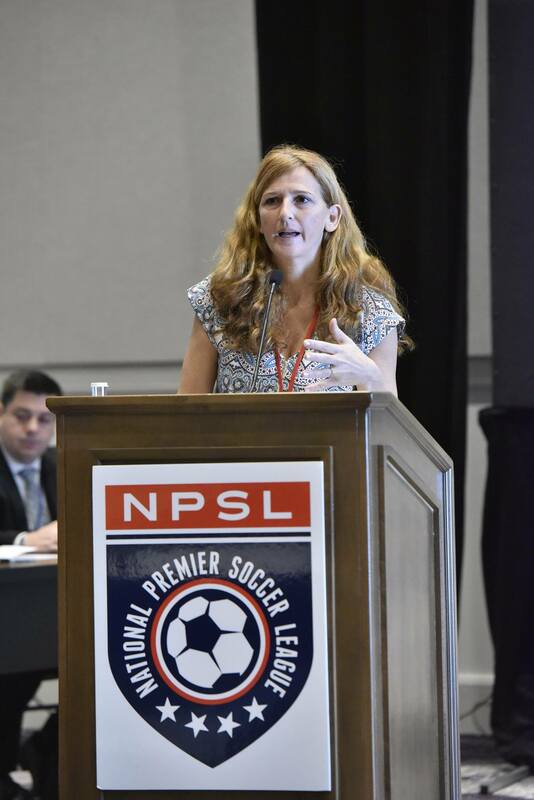 Our editor Jason Bruzzichesi was able to communicate with Cindy via email about her new role, her history, and what the future of the NPSL will look like with her influence. MFP: We understand you’ve held other positions within the NPSL and have had a good amount of experience in amateur soccer, but your background has been in finance. Can you describe the transition from that environment into the world of soccer? CS: The NPSL is a business, albeit a soccer business. There are a lot of similarities. Managing the financial side of the business, having tight operations, and creating an environment where the staff and the individual teams can be successful are the pieces that translate the most easily. The aspects that differ the most are expansion and sponsors/partnerships. To respond to that, we have (or are hiring) strong staff members to concentrate in those areas. The good news is even while I was out in the investment banking world, I was still very connected to soccer and was fortunate to stay involved in the game. It was a smooth transition to become increasingly involved with the NPSL over time and ultimately take on this role. MFP: Most players move on to other ventures after their playing career is over. What made you decide to come back to soccer? CS: The truth is I never really left. I had always managed somehow to stay connected to the sport on some level. After playing for the Rough Riders women’s team on Long Island, I made the switch to the New York Athletic Club (NYAC) women’s team to avoid the travel to Long Island, since I was living and working in the city at the time. After that, I helped manage the NYAC’s men’s and women’s team as a volunteer while I was working full-time. That lead to serving on the NPSL Board of Directors as the Treasurer. I was also volunteering for the WPSL at the time and helping Jerry Zanelli with the league’s North Region. When I left Morgan Stanley in 2013, I was picking up more and more volunteer work for the NPSL since I had the time. When the opportunity came up to work for the NPSL, I was fortunate to be asked to take on the position. That was in 2014 as the Director of the league and things evolved from there. MFP: Expanding upon that, why do you feel there are so few women in executive positions in American soccer? CS: Women are becoming more visible in executive positions across technology, banking, and manufacturing businesses. We are seeing women break barriers in the entertainment business as well. I believe that the sports industry will follow that trend. We already see it with female television journalist being just as prominent as men in covering NBA, NFL, MLB postgame interviews, as one example. Ten to fifteen years ago, you rarely saw a female reporter do a postgame interview with a male athlete. The female reporters covered women’s sports. That has changed. I believe that the amateur soccer world will catch up and we are hopefully only a few years away from that question becoming irrelevant! MFP: Everyone who comes into a new job believes that they can bring something unique to the role. What do you believe your impact will be? CS: I think that one thing I can bring to the role is increased pace towards results through more clearly defined processes. There is so much potential in this league to improve, grow, and expand. I am thinking about creative ways to put processes in place and guidelines to streamline different aspects of the business. As an example, you can talk to a potential new team or a new sponsor for weeks, sometimes months, because everyone is going to be the next great team or offer the league a great sponsorship deal. I want to quickly have a process to break things down efficiently and empower our staff to make decisions. I want to develop ways to recognize what relationships are a fit with the league and close on new members and partnerships in a shorter cycle. MFP: With nearly 100 teams in the league, your position may seem overwhelming on paper. Please describe what a day in the life of a Managing Director is like. CS: Like most businesses, the NPSL has a business cycle. Presently, we have kicked off the playing season in the West and the South Regions. I start the day by checking game scores, attendance levels, and anything eventful at any of the games, for example, if we had an unusually large crowd in a particular market or if we had a highly publicized exhibition game in any of our regions. Currently, I spend a lot of time speaking to members and our Board of Directors and understanding the priorities from those perspectives. There are plenty of new ideas and projects that are interesting and worth exploring. I am cognizant that transitions will create a level of temporary instability. We have 700+ games to manage until our national championship. At this moment, my #1 priority, along with the staff, is to stay laser-focused on the actual season and ensure that everything runs smoothly and that we deliver for our teams and our supporters. I am staying closely connected with the staff as we run the league season. I am meeting with board members and team owners to assess priorities and form a strategy for the next three months, six months, and develop a strategy for the next three to five years. MFP: The NPSL has grown exponentially in the last few years, what types of infrastructure are the league putting in place to ensure that stability and growth continues? CS: As mentioned earlier, I want to work on tightening up our processes and empower the staff we have. The good news is we have fantastic, talented staff already in place. We now need to give them increased autonomy and decision-making power – within a defined process. One area where this is a focus is expansion. We get inquiries practically every day. Dina Case is our Director of Membership Development and manages that department for the league. We are looking for technology solutions for her and a web-based application system so she can spend more time vetting teams and less time on administration. I was involved in outsourcing for Operations in a former position. I think there is an opportunity to cave out some of our more repeatable functions that are lower on the complexity curve and give them to an outside data management or customer service operations. This way the staff can concentrate on personal service to our teams and add more value for their time. MFP: The UPSL has recently moved to broadcasting on MyCujoo and other leagues are using YouTube for their games. Are there any plans to follow suit and broadcast league-wide, and if so, what kind of coordination would that require from both the league and the teams? Many of our teams record games for uploading on YouTube currently and stream games live. That, combined with our weekly TV show “This Week in the NPSL,” we feel that we have a good product to satisfy the market for that type of coverage. We have explored using one consistent platform for live streaming and recordings. The challenge is finding one solution that serves the needs of the league and its members without being cost prohibitive to the teams. I am not aware of how many teams in the USPL participate in their program – and do it consistently. That would be an interesting data point to know. If we are going to choose one consistent platform, we want it to be flexible and affordable. Introducing a platform then having only a small percentage of teams participate is not a success story, nor does not help the teams or the league – so we want to avoid that. For this season, we believe the TV show provides a very strong summary of the games that week as we explore what a more comprehensive solution could be for the NPSL. MFP: Grassroots soccer is the driving engine for fandom. What is the NPSL’s plan to engage and encourage more supporters in the same volume as Chattanooga and Detroit City? CS: On a league level, the NPSL has set up a platform to allow for supporter groups to engage with the league and thrive in their markets. We focus on our supporter groups across social media and follow the events with the various groups. Our awards program allows fans and supporters to have their voice heard, knowing that their input is incredibly important and that they are a true stakeholder in the league. MFP: The shortened season leaves the NPSL at a distinct disadvantage when it comes to capturing the attention of sports fans. Are there plans to lengthen the season and if so, what are they? The NPSL is a member-driven league, a not for profit with member teams making up the Board of Directors. To the extent that there is a demand from our members for additional league attributes or opportunities, we explore those ideas. We are currently exploring ways to offer additional products to our members, including different levels and lengths of season. We are talking with teams and doing the analysis. No decisions have been made. MFP: With owners like Tim Kelly of Chattanooga and Dennis Crowley of Kingston Stockade, a new style of wealthy backer has become popular in the league. However, since the rosters are mostly amateur, there is little competition to bid for the highest paid players. Does this model promote the spirit of parity and competition and prevent affluent teams from dominating the league? CS: The NPSL is an amateur league that gives teams the option to register professional players should they choose to embrace that model. We have very, very talented amateur players in this country that are as good as professionals. Going the “professional” route does not always guarantee success on the field. The 2017 NPSL National Champion, Elm City Express, did have a majority of professional players, while the 2016 NPSL National Champion did not have any. MFP: Are there any examples of a front office or ownership group that seems to have mastered the model of operations in the NPSL? If so, what makes them stand out and how can other teams emulate their success? This is a great question because it allows me to make the point about the different models for our teams and to discuss what “success” looks like in the NPSL. Of course, our most recognizable and successful teams have drawn great crowds, have figured out how to sustain significant revenue streams, and have smooth operations. These teams understand their markets and have the sales aspect of the business largely unlocked. However, that is not the only measure of success. Some of our teams define success by leveraging their NPSL team as a platform to reach inner-city youth and give them opportunities to identify with positive role models and participate in scholarship camps or free clinics. Other clubs position their NPSL team as a progression for their youth club – its gives the players in their youth program a chance to “look up” to the top of their club structure and aspire to someday play on their club’s NPSL team. The Brooklyn Italians is a good example of that. New Jersey Copa FC would be another. Some teams exist to make soccer accessible in their communities. If these teams can give players a place to play, engage the youth through camps and clinics, provide a source of entertainment for their hometown – and break even financially, then those teams have realized their goals. We strive to attract teams that make an impact on soccer in the United States, and there are several models that can achieve that. We seek to provide a nimble and flexible platform with a support structure to enable teams to achieve a wide variety of business goals. Editor’s Note: Some informational content and images in this article were used with permission from the NPSL. No questions or answers were edited for content or grammar however some interview questions were omitted due to a lack of response.